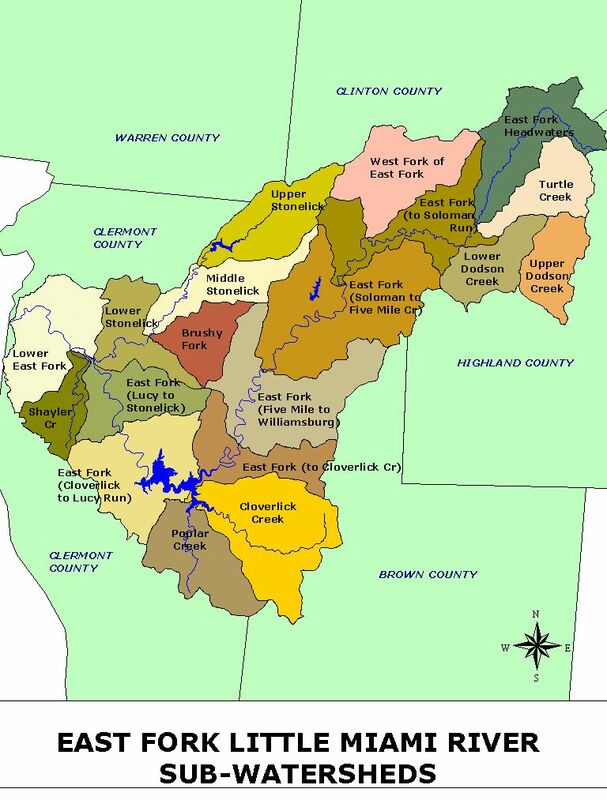 The East Fork of the Little Miami River (EFLMR) watershed encompasses an area of approximately 320,000 acres (500 square miles), and incorporates portions of five counties. The Clermont portion of the EFLMR is approximately 243 mi2, or almost half of the watershed. The land areas of the EFLMR are representative of Clermont with urban areas in the southwestern portions and agriculturally dominated areas to the north and east. More than 20% of the watershed is forested with a large amount of forest cover in the vicinity of Harsha Lake. The areas downstream of the Lake are a mixture of suburban and agricultural uses, as well as forest and open space. The watershed upstream of the lake is dominated by agricultural land uses. The watershed supports a variety of stream uses, including an Exceptional Warmwater Fisheries Habitat as classified by Ohio EPA, and many different recreational activities, including swimming, boating and fishing. The East Fork also serves as a major public water supply source for the County. The EFLMR is impounded to form Lake Harsha, a 2,200 acre reservoir which supplies six million gallons per day (MGD) of drinking water to the County. In addition, Lake Harsha and the surrounding East Fork State Park are a primary destination for many County residents during the summer who are looking to swim, ski, or camp. The East Fork Watershed Collaborative was formed in 2001 with a mission “to enhance the biological, chemical and physical integrity of the East Fork Little Miami River and its tributaries” The Collaborative has gotten the Headwaters, Lake Tributaries, and Lower East Fork Little Miami Watershed Action Plans endorsed by the Ohio EPA and is currently developing the Middle East Fork and Stonelick WAPs.